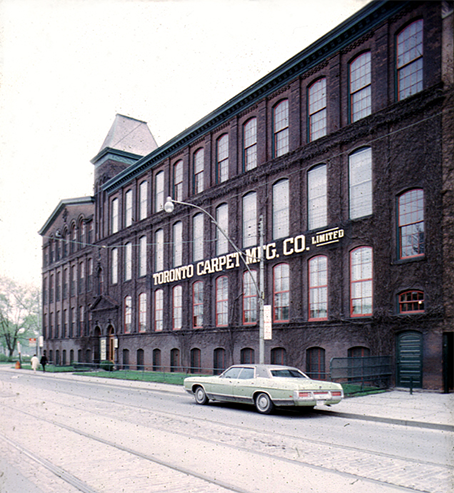 The history of the Toronto Carpet Factory begins with the company whose name it retains, the Toronto Carpet Manufacturing Company Limited, established by F. Barry Hayes in Toronto in 1891. 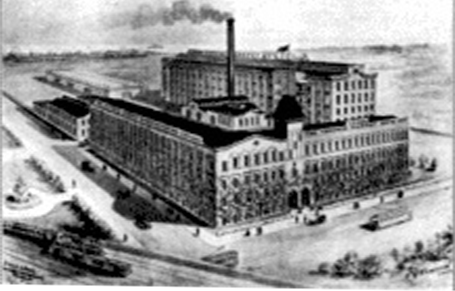 By 1899, the burgeoning Toronto Carpet Manufacturing Company Limited, had outgrown its cramped space at Jarvis and The Esplanade and moved into an impressive new factory at 1179 King Street W. and 74 Fraser Ave. 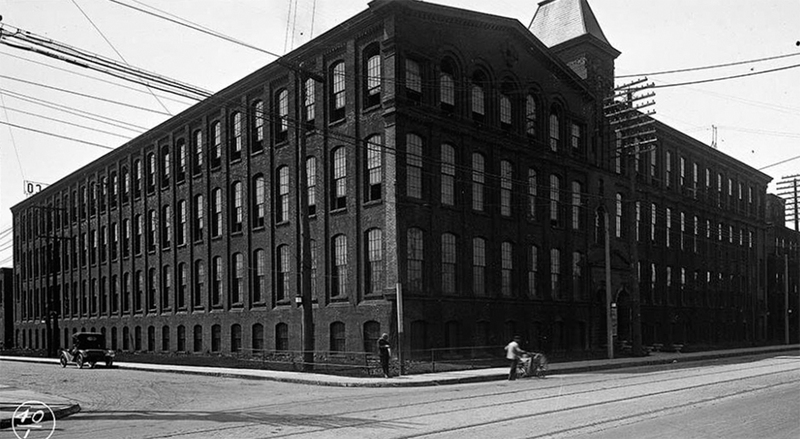 The company couldn’t keep up with the demand of the Canadian market for its ingrain and chenille Axminster carpets and within five years had added its own spinning and carding facilities, as well as additional looms to produce Brussels and Wilton carpets, in the new addition located at 67 Mowat Ave.
By the end of the First World War, the factory occupied one city block and employed over 1,000 people, about the same number of people who work at the Carpet Factory today. The buildings are similar in architecture to other industrial buildings being built in Britain and the U.S. during that time. They were constructed in the classic 19th century style of perimeter buildings forming a cloister around a central quadrangle and powerhouse. All of the buildings are of heavy timber construction with load-bearing brick walls, timber columns and beams, and hardwood floors. All roof decks are timber, with the exception of the boiler/generator room which is concrete slab. In its time, the site was considered to be “state of the art”, completely self-reliant, with its own steam-generated heat, power and electricity capabilities, fire pump and an underground cistern storing 625,000 gallons of water for emergency use. The cistern remains buried beneath the floor of 72 Fraser Ave. A maze of catacombs (steam pipes) still delivers heat through the site. Ceiling heights range from 12’ up to 22’, and 24’ in some of the corridors of the Mowat Ave. building. For over a century these buildings have been places for creating. 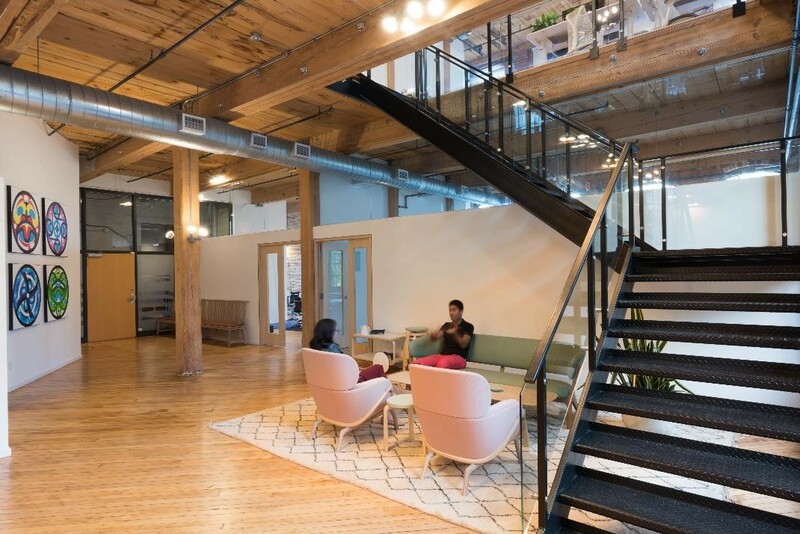 Though the products that originate here have radically changed over the years, we are proud that this complex continues to provide spaces that inspire new ideas and ambitious companies. Built Constructed at the turn of the last century. On-going restoration. Elevators Most buildings have freight elevators and shipping and receiving facilities. 67 Mowat Ave. serviced by an accessible entrance/elevator, passenger elevator. 1179 King serviced by passenger elevator; accessible entrance. Window Details Gracefully arched windows up to 6’ wide and 13’ high. Most windows are operable. Air Conditioning Central chilled water system allows custom designed A/C for each suite. Combination of rooftop units and split systems. Electrical 100 amps per 2,500 square feet. 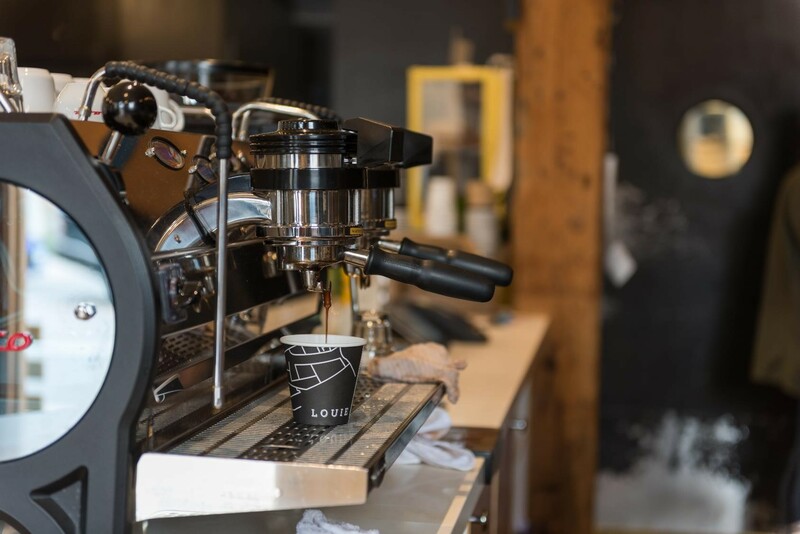 Four on-site restaurants: Louie Craft Coffee, Shoeless Joe’s, Caffino, School Bakery and Cafe. Parking On-site parking at current market rates. Carpet Factory also has priority parking available at Lamport Stadium, adjacent to the site. Daily Lamport and street parking also available. Transportation The complex is readily accessible from the Gardiner Expressway and Lakeshore Boulevard, and is a ten-minute ride from the financial core on the King streetcar that stops right outside the front door. The Dufferin bus line is one block away and it’s a five minute walk to the Exhibition GO Station. Autoshare vehicle on-site. Members of Smart Commute. Exterior The entire city block has been designated as a property of historical and architectural value under the Ontario Heritage Act. Exceptionally fine Toronto red brick masonry, elegant stone and wrought-iron details. Interior Hardwood floors, sandblasted brick feature walls, heavy timber construction with many top floor suites featuring massive timber trusses and cathedral ceilings. 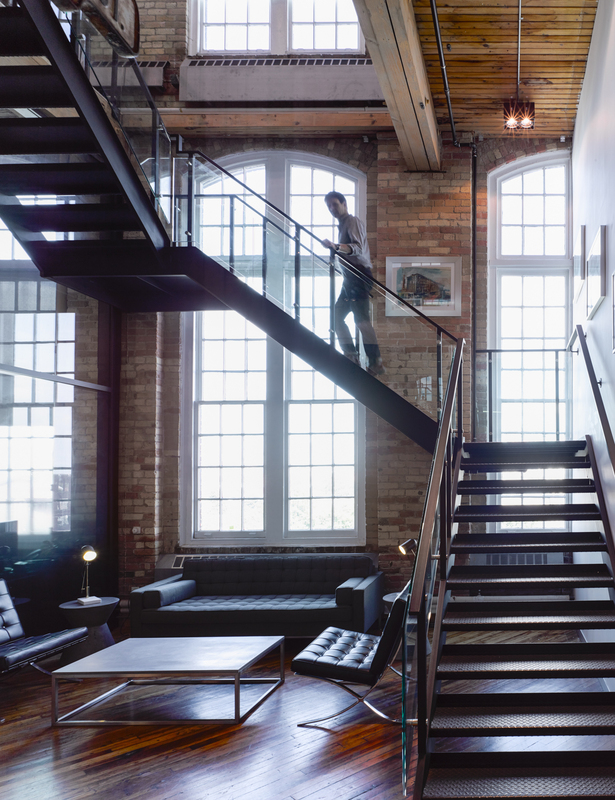 Well-Located Film and video companies, post-production firms, marketing and communication agencies, software developers, architects, boutique law firms are the core of a highly creative community at the southeast quadrant of King and Dufferin, an area known as Liberty Village. 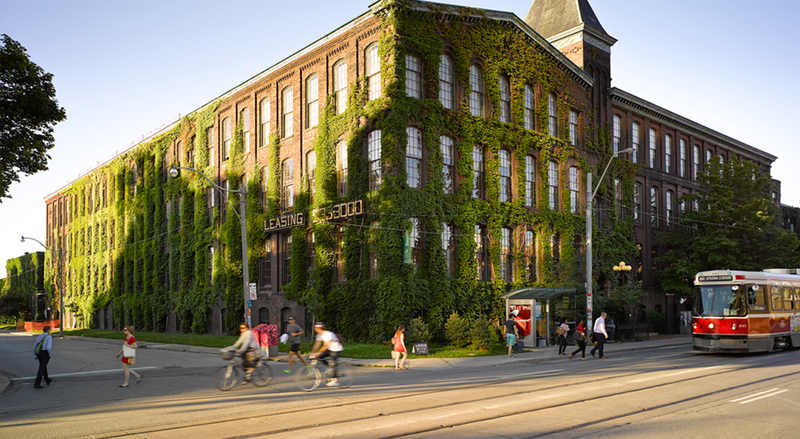 At the centre of this community is the Toronto Carpet Factory, a 320,000 square foot complex of eight buildings, on a four-acre, one city block site, housing over 125 businesses. Air Quality Most windows are operable. All York Heritage buildings have air quality routinely assessed and compared to Canadian and international air quality regulations. Safety and Security Tenant security takes priority at the Toronto Carpet Factory. With only six floors to serve, we are able to expedite the job with maximum efficiency – a fully integrated sprinkler, smoke detection, and fire alarm system monitored by a 24-hour/7-day control centre. All exterior main doors lock automatically at the close of each working day. After-hours entry is restricted to authorized personnel with access fobs. Visitor access, after-hours, is enabled by tele-entry system. A monitoring service and guard patrol add to our over-all security. Property Management We, not a management company, are responsible for the quality of maintenance and repair of our lobbies, corridors, windows and other public areas…and we care very much. If anything is not working properly, we respond to the call. Chances are, we’ll not just send a repairperson, we’ll accompany them. Landlord Reputation Finally, and perhaps most importantly, the businesses that choose our buildings recommend us. If you have not had the opportunity to review their testimonials, we urge you to do so now. Their approval is your best assurance that in choosing the Toronto Carpet Factory, you have made the right decision. The Toronto Carpet Factory has an enthusiastic and experienced team, focused on meeting our customers’ needs and exceeding their expectations. Please check out what our customers have to say about us. They recommend us because they know how committed we are to ensuring their space works for them.